If you are thinking of having a loft conversion to help increase the space in your home, why not add an additional bathroom, it can be one large bathroom or an ensuite attached to a bedroom. Here we tell you all about the essential plumbing people often don’t think about when it comes to a loft conversion bathroom. What plumbing do I need for my loft conversion bathroom? With the housing crisis currently in action across the UK rather than moving home, there is in an increase in the number of loft conversions taking place across the country. It is a lot more cost-effective but also allows you to stay in your home as well as adding a little more space for your ever-growing family. Depending on what space you have will depend on what you put in it, for example, if it is a small loft conversion and you already have enough bedrooms you could make it into a larger family bathroom. 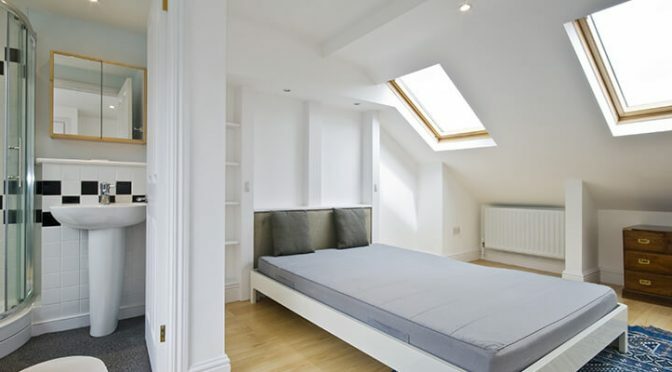 However, if you need the loft conversion to be a bedroom why not add an ensuite. You do not always need a full bathroom in the loft conversion, only the necessities such as toilet and basin could work for you. To make your loft conversions more valuable in terms of cost but to you and your family as well adding a bath or shower will provide you with additional space to get ready in the morning. There are a couple of things you need to seriously think about when it comes to adding a bath and shower into an ensuite. First things first are a layout; you want to get the best space possible, if your struggling with where to situate your bathroom furnishing why not contact plumbers in Milton Keynes for advice. Plumbers fit a great deal of bathroom installations day in day out, so can provide fantastic insight into how your bathroom will best suit how you want to use it but how to utilise the space you have. A bath will take a significant amount of space in comparison to a shower, however, if your ensuite or bathroom has a slanted roof with limited headspace, this is the perfect place to put your bath. While the shower takes up less space, you will need a full height ceiling for it to fit comfortably. If your loft conversion is solely a bathroom, you may want to think about having a bath as well as a shower. To give you the option of where you wish to wash, it is also a good idea to have a bath if you have a young family. Plumbing can be tricky when it comes to loft conversions because you have to work around the existing plumbing within the house. If you are thinking about installing a bath, you will want to place it as close to the current supply and waste pipes as you possibly can. Not only does it make it a lot easier for the bath to be installed but it will also save you a considerable amount of money as you do not have to move or extend any of the waste or supply pipes. These pipes are usually located at the rear or side of the house which makes it easier for you to decide where to place your bath or shower. Waste pipes are larger pipes which can be challenging to get to bend around corners and other areas of the house. There will also need to be a specific fall or gradient to the pipe to allow the waste to flow through it properly. We always recommend avoid changing the location of your waste pipes as much as you possibly can. If you are thinking about extending the pipework or changing the layout of your bathroom we highly recommend getting in touch with plumbers Bedford, this is not a job you should carry out yourself as you could ruin your current plumbing systems which will only cause more issues later on. Getting water up to your loft conversion is not as tricky as you think. If you are thinking about which showers to go for we always suggest looking at electric showers. You will not have to worry about fitting a water tank to the small space you have left in your loft; it is also a much more cost-effective solution. If you have a combi boiler or are thinking about getting a combi boiler it will do wonders in helping the water to heat instantaneously. You will also notice it is a lot easier for you to get water up to other areas of the bathroom such as the basin. Another aspect of your new loft conversion bathroom you will need to think about is the ventilation. There would be nothing worse than having dampness issues or water damage due to pore ventilation. If you have enough room you may want to think about installing a small tinted, or frosted windows from CS Windows. A window also gives you added advantages such as giving you natural light in the bathroom. You may also want to think about an extractor fan; a great feature is that you can have it turn on whenever the light is switched on. Make sure if you are thinking about a having a bathroom installed into your loft conversion you consult your local plumber such as JF Plumbing Solutions. By discussing your plumbing solutions with a plumber and having them installed by a highly qualified one you can be sure to have no plumbing issues in the future. Make sure you think about the current space you have and how an added bathroom can work with you and your family. You do not always need a full bathroom if you are looking only to add a toilet and basin this might be what works best for you. Tag us in all of your bathroom loft conversion pictures over on our social media platforms!